Read the whole review below or jump to any section using the main headings below and the sidebar on the left. Or you can download a complete copy of this sector review as a pdf document to read separately. The originating author of this health sector review is Mark Pyman, who is the managing editor of CurbingCorruption. Additional contributions have been made by Rich Feely, Sarah Steingrüber, Taryn Vian. 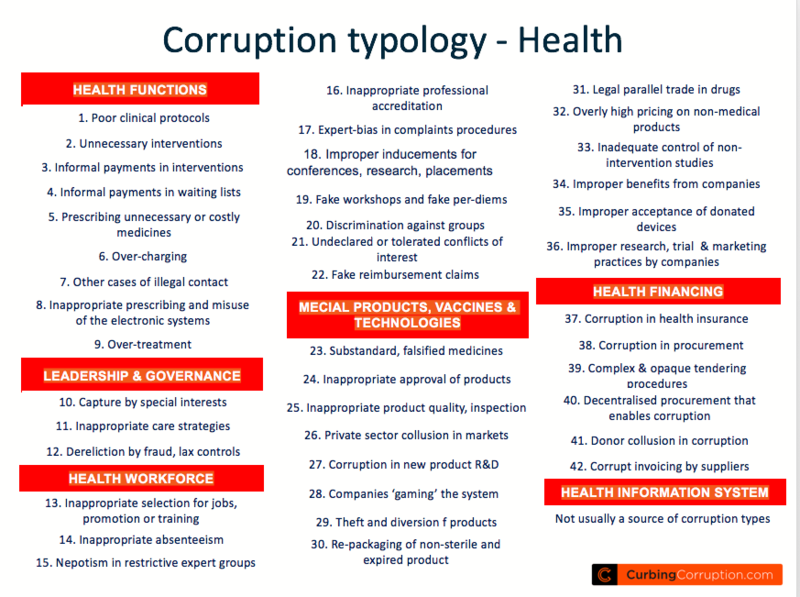 Our typology identifies 48 different types of corruption in health. We categorise them according to the six WHO building blocks. Some corruption types are generic, like favouritism in the appointment and promotion of staff, but most are specific to the health system, such as bribes to advance on the surgery waiting list, or unnecessary operations, or collusion in the pricing of medicines. 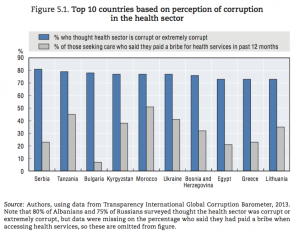 Some corruption types are specific to just a few countries, for example health insurance, which is a huge issue in the USA (See Rose-Ackerman and Palifka, 2016). Collectively, this list is called a ‘corruption typology’. 8. Inappropriate prescribing of prescriptions and misuse of the electronic prescription system. The HMIS is rarely a source of corruption itself. People working in the health system know this and take advantage of it, so it is an indirect contributor to corruption. Poor operational and management data means that corruption goes undetected and unreported. Gross inefficiencies persist, which encourages corruption to bypass the system. Poor forward forecasting of medicines use, means abuse of stocks is easy. Budgets to hospitals and to each part of the health system may not be based on a solid rationale; this leads to perverse incentives or no incentives to reform areas of ineffectiveness or corruption. In a mixed public/private system, competition from the private sector can drive additional corruption if the MIS does not give adequate transparency. Poor stock management allows multiple corrupt practices on inappropriate ordering, re-selling, gaming of stocks between central and local stocks, etc. Stocks are needed locally, but there may be few central controls nor regular review of appropriateness of usage of medicines and supplies. 40. Highly decentralised procurement, where purchasing is separately implemented in each hospital and agency, allows for both inefficiency and corruption. 42. Corrupt invoicing by suppliers, sometimes in response to government delayed payments. Transparency International’s Pharmaceuticals and Healthcare programme (ti-health.org) lists 37 different corruption issues across pharmaceuticals and healthcare, as shown opposite. Outsiders with have power and influence, who force the above two types of people to be corrupt according to their requirements; up to and including getting them appointed in the first place. Patients, because paying a bribe may give them more certainty of outcome, such as achieving a better position on a waiting list or access to an ICU bed. This is ‘sort of’ voluntary, but it is also a form of extortion. Aggregate, comparative data: You may want, or need, to present specific corruption data on your health system. Such information comes usually from national and sub-national surveys, which you may be able to use, or to piggy-back on. Groups like Transparency International, World Bank and OECD also do larger surveys across many countries, which can also be surprisingly detailed about the individual countries. The OECD has done several analyses of corruption in health. Opposite is data from an OECD 2015 analysis, showing the 10 ‘worst’ countries for health corruption, and making comparisons between them. Or you can commission your own – many countries do this, as the EU 2017 example at the beginning of this review showed. Example: the need for ‘help’ to access services in Serbia. Serbia has been paying significant attention to corruption. Here is one survey analysis of which sectors are the best and the worst for accessing services on your own and without having to pay for extra assistance (‘help’). It shows up police services, health inspectorates and patients organisations as being difficult, high corruption areas. Local national or sub-national data on health corruption. Your health system may have its own data on fraud, corruption and patient complaints, some of which will be about corruption. If you can use these, do. NGOs and patient associations may also be well informed. Local anti-corruption NGOs may be prepared to carry out a survey or analysis for you, or you can commission an external analysis. Ask around or looking for local data yourself. Nowadays there is a lot of research and surveys in corruption, and it may be that others can point you towards it. For example, recent re-analysis by researchers of global data from Transparency International’s Global Corruption Barometer is showing up country specific and sector specific trends in corruption. You may not know about such analyses yourself, but if you ask around in the sector, or ask us at CurbingCorruption, you may find more useful material. According to a recent re-analysis of Transparency International’s Global Corruption Barometer (GCB), the bribery rate for health services had halved for service users between 2010 and 2015. Such a stark reduction in the health sector’s bribery rate was statistically improbable. This analysis was done by Peiffer et al (2018) at the Leadership Development Program. The reduction would seem to be the work of the relatively new Health Monitoring Unit (HMU). A highly visible institution with an exceptional degree of support and direction from the president, the HMU developed a strategy to improve accountability in the sector. This included high profile raids. Through highly visible investigations, the HMU seems to have been effective in making health workers in the country significantly more cautious, reducing their willingness to request bribes. Requests for bribes for health services appear to have decreased as a likely consequence of the HMU’s efforts. However, though there have been bribery reductions, the naming and shaming approach has also led to reduced morale among health, because of perceptions that the HMU had unduly harassed many innocent health professionals. The above list of specific health corruption issues may be sufficient for your purposes. Alternatively, you may like to make your own list of corruption types relevant to your operations. You will want to consider whether to pick out the most serious, and/or the most common, or the most distressing for patients, or the costliest, or the ones that should be easiest to solve. Doing this analysis can be a two-hour exercise or it can be a six month one. The quick way is always attractive. Your own staff are usually well aware of the corruption issues. Health professionals are among the most committed people in the world, with extensive experience of working in large, complex, bureaucratic environments. Hence, they are likely to be the best informed about what the corruption problems are, which ones can be tackled, and which ones need to be left for later. Give them the typology of health corruption types above and ask a group of them to analyse which are the more relevant ones and their relative importance. This simple approach has the advantage that you can quickly capture the ‘top of mind’ knowledge of your senior professionals. It has some disadvantages, notably that it is likely to focus on the more immediate issues. In the mid-range, you may have specialist groups with extra knowledge, like internal audit groups and clinical audit groups. Together with external groups like community health groups, patient communities and civil society, you can get a more inclusive analysis done, still quite quickly. It has the same disadvantages as above. At the most thorough end of the spectrum, you can get a detailed analysis done by groups with professional anti-corruption knowledge, if possible combined with health expertise. These groups might sit within universities, or civil society, or think tanks. You can consult our list of sources of expertise in Reading & Bibliography, that can give you some guidance. Such analyses are likely to take from two months to six months. In large initiatives, there are several analytical techniques you can consider, such as Vulnerability to Corruption Analysis (VCA), Public expenditure tracking surveys (PETS) and Quantitative Service Delivery Surveys (QSDS). Read more about techniques for analysing corruption vulnerability in our Guidance Step 1 – Analyse the specific corruption types. There is also an obvious and often sizeable political advantage to having a thorough, independent analysis done of the corruption issues and risks. If you have time and funds, we recommend that you do a thorough analysis. In 2012, Ethiopia was starting to open itself up to external scrutiny about the levels of corruption in the country. This was stimulated by their poor standing in the Transparency International Corruption Perceptions Index of that year. They commissioned analyses by external experts on each of several sectors (construction, telecoms, health, etc.). The health analysis, not surprisingly, pointed out a range of problems (Savedoff and Grepin, 2012). They provided a typology of the problems that could be used by the Ethiopians: Procurement (poorly functioning reporting systems and weak oversight); Pharmaceutical management ( Concerns on the licensing, selection, and sale of medicines; pharmacists’ opportunities to exploit patients; and a growing black market for pharmaceuticals); Regulation (The inspectors who enforce the health regulations are poorly paid and vulnerable to requesting and accepting bribes); Unequal patient treatment (Although illegal payments did not appear to be a major issue in Ethiopia’s front-line service delivery, many interviewees reported complaints that providers give preferential services to friends and colleagues); Rising foreign and other donor aid (the influx of funds outside of the public system and the sheer size of these new funds have also increased the risk of corruption). There are fewer examples of health corruption reforms than we would like to see. We think this is because corruption within the health sector is less talked about than you might expect. In high income countries like the EU, as we quoted in the introduction to this review: ‘The health sector (in the EU) is one of the areas that is particularly vulnerable to corruption, but relatively little is known about this subject.’ (EU 2017). This is a large category, including organisational reform, service delivery and other clinical reforms, reforms to non-clinical processes, reforms to management information systems, and technological reforms. There are usually more reform measures in this category than you can possibly accommodate. The question is one of prioritising, using criteria such as relative impact, political opposition, or the risk of slow implementation. This is where the anti-corruption work will be most clinically facing. There are likely to be multiple initiatives and reforms going on at any one time to improve service delivery in a national health system. Such work to improve patient outcomes is the core business of any health system, and the corruption aspect will only be one element of this. 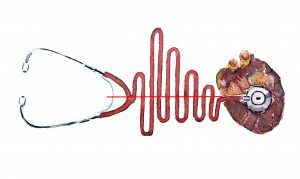 The way that clinical protocols and pathways operate is very closely linked to the corruption opportunities that they throw up, whether this be for unnecessary procedures, or overtly expensive ones, or pathways that favour one medical group over another, and so on. This is as true in developed country environments as in developing country situations. Example: Preventing informal payments in Armenia through a child certification programme. The Health system in Armenia is complex but underfunded, and much of the payment for services comes directly from citizens, of which about 70% are for ‘informal payments’, rather than for official services or payment for medicines. This reform initiative focused on informal payments for child health, and a ‘Child Health State Certification Program’ was designed and implemented. USAID reported as follows: ‘The findings of the quantitative assessment clearly demonstrated that the Child Health State Certificate Program significantly reduced informal payments for paediatric inpatient care for children 0-7 years of age and increased accessibility of care for those who could not afford it previous to the program’ (USAID, 2011). Example: Reform of clinical pathways and payment system in Vietnam. ‘Researchers from Vietnamese Health Economics Association, a civil society organisation with support from AusAID (Australia), are developing a case-based reimbursement methodology, which they believe can help improve transparency and reduce perverse incentives in the health care delivery process. Case-based payments, established prospectively based on estimated resource needs for standard care, replace fee-for-service reimbursement. Under this kind of payment system, providers no longer have the incentive to use many diagnostic tests or potentially ineffective treatments to maximise revenue. Working in four pilot hospitals, the research team collaborated with facility personnel to develop care pathways for the treatment of three types of cases: pneumonia (medical), normal delivery (obstetrics) and appendicitis (surgery). For each of these cases, the researchers developed criteria for admission and discharge, indications for standard mandatory and other diagnostic tests and imaging, guidance for selection of drugs and criteria for other interventions.’ (Vian, 2012). Other examples of bribes for service delivery. There are many more analyses from other countries of the small bribes paid to navigate national health systems, and the ways in which the authorities tackled this common problem. There are further examples described by Vian et al (2015), Stepurko et al (2010), Bjorkman and Svensson (2009), Liarapoulos et al (2008), Rispel et al. (2016). Improving the way that the multiple systems and processes of the health system works is a natural way to reduce corruption: by reducing procedural complexities, streamlining budgeting, automating cumbersome procedures, improving controls, improving the range and reliability of performance indicators, etc., etc. However, be cautious. It is tempting for officials to focus on these types of improvements, because they are technical, can be defined precisely, and are usually relatively non-political. However, there are two problems. First, they can tend to take time to put in place, easily 12-24 months. This is a real issue – the timeline to results will be longer than what you would want to show progress to citizens. Second, there is also a more cynical aspect: the fact that the work takes time allows progress to be proclaimed until sometime after the momentum for change has dissipated. Those opposed to corruption reform can therefore safely support such initiatives, anticipating that they can be slowed down again in 12 months’ time. Example: Health procurement corruption reform in Ukraine using ProZorro. Ukraine has made excellent cost savings in the health sector (and in other sectors as well) through procurement anti-corruption and transparency reforms. See “Everyone sees everything; the overhauling Ukraine’s corrupt contracting sector”. Example: The Open Contracting Partnership. OCP is an excellent multi-country reform initiative measure that is being used by a wide range of countries, from the UK to Mexico to Afghanistan. It starts at the planning stage, and covers tenders, awarding, and implementation of public contracts, including in health. Improved Health Management Information Systems (HMIS) are one of the most crucial technical levers for reducing corruption. This happens both by direct changes, such as by better medicine stock management, and indirectly, by providing reliable data on the performance and relative performance of all parts of the health system. This is at least as much an issue for developed countries as for developing ones, because they are often working with large, cumbersome systems that are too expensive and sometimes too complex to replace. In such cases, simple web-based solutions alongside the old systems to get over some of the worst efficiency and corruption problems may be as much a corruption reform as an efficiency reform. Greece, for example, has made great progress with a Business Information’ portal for health that has been able to circumvent their huge problems with inflexible, complex old systems. Note that the same cautions apply as with the non-clinical improvements already discussed: It is tempting for officials to focus on these types of improvements, because they are technical and tend to take time to put in place, e.g. 12-24 months. There are multiplying numbers of reforms using new technologies, mobile apps and social media that may also reduce corruption. A recent review identified 15 distinct ways of using technology for good governance activities in LMIC health care. These use cases clustered into four conceptual categories: 1) gathering and verifying information on services to improve transparency and auditability 2) aggregating and visualizing data to aid communication and decision making 3) mobilizing citizens in reporting poor practices to improve accountability and quality and 4) automating and auditing processes to prevent fraud. From Holeman et al (2016). For a review of data mining processes to reduce fraud in health, see Joudaki et al (2015). Ministries can easily become corrupted. If the problem is deep rooted, you need to consider also whether changing the mandate and/or structure of the Ministry and/or the health system organisation might reduce the problem more fundamentally. Example: Benefits of Public-Private partnerships in Lesotho, Southern Africa. Lesotho has explored the use of Public Private Partnerships (PPP) to improve health governance and the corruption impact of such reform seems to be beneficial. An independent assessment concluded that ‘Corrupt practices that were described at the government-run hospital (theft, absenteeism, and shirking) were absent in the PPP hospital. In the PPP hospital, anticorruption mechanisms (controls on discretion, transparency, accountability, and detection and enforcement) were described in four management subsystems: human resources, facility and equipment management, drug supply, and security. … The PPP hospital appeared to reduce corruption by controlling discretion and increasing accountability, transparency, and detection and enforcement. Changes imposed new norms that supported personal responsibility and minimized opportunities, incentives, and pressures to engage in corrupt practices. By implementing private-sector management practices, a PPP model for hospital governance and management may curb corruption.’ Vian et al (2017). 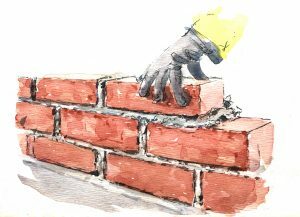 Most people in most organisations hate corruption but feel trapped and disempowered by it. Building a team of officials across the ministry and related agencies who share the vision of what can be achieved with less corruption is therefore a key place to start. Ask someone to open up these discussions across the organisation. Example: Using a questionnaire to tease out peoples’ opinions. You could use a questionnaire to bring out peoples’ opinions. Here is one example opposite for local government employees from UN Habitat 2006, but it could easily be adapted for health. For each of the ten statements, there are four choices, to register whether you agree (score 1) or disagree (score 4) with the statement, and how strongly. The results indicate to the respondent and to you how big a barrier there may be to tackling corruption and is one way to start the conversation. 2.2.3 Leadership team discussions. This author has been present at such discussions in numerous professional leadership groups, from global companies to health leadership teams, from clean Scandinavian countries to conflict countries. Each of them was initially reluctant to engage in open discussion about corruption. This changes quickly once you make it clear that this is not a taboo subject, and that your purpose in tackling it is not punitive but is constructive, because it will actively improve access and service for your patients. You can do this in round table conversations. 2.2.4 Informal forums. Set up one or more forums where people can come and demonstrate their commitment to your plans. Sometimes people – public officials, citizens, whoever – are ready to help but don’t have a forum around which to congregate. Patients groups and Community groups can provide a powerful voice not only on which corruption issues hurt them most, but also what the solutions can be. 2.2.5 Formal coalitions. Focus your efforts on building a coalition across multiple stakeholders. media outlets: investigative journalists, reporters, social media and Internet websites. This analysis of the role of developmental leadership in the passage into law in December of excise tax reform which significantly raised taxes on cigarettes and alcohol – generally referred to as the Sin Tax Reform’ is taken from Sidel (2014) Achieving reform in oligarchical democracies: the role of leadership and coalitions in the Philippines.It is also quoted in Development Leadership Programme (2018) Inside the black box of political will. A broader form of developmental leadership was critical to their passage into legislation and their subsequent implementation, comprising reform coalitions that incorporated elements of government, the legislature, and civil society. While these coalitions were diverse and flexible in their form and composition, their core strength came from established advocacy groups and experienced activists. These groups and activists used highly labour-intensive, specialized and complex forms of mobilisation. Plus there were also ‘allies of convenience’: The reform coalition found itself in alignment with British American Tobacco (BAT), which openly sought to ‘reform’ a tiered tax classification scheme which greatly inhibited the entry of its products into a market monopolised by others. The success of these reform coalitions has implications for economic and governance reform in the developing world, particularly in systems characterised by oligarchical democracy, where competition for elected office is closely linked to the entrenched interests of business and industry. In the event, the passage of the bill secured billions of pesos in annual new tax revenue for the government and contributed to growing investor confidence in the Philippines. The Sin Tax Reforms had significant health implications as well. The passage of the bill also demonstrated that it is possible for reform legislation to overcome resistance from powerful special interests, thus emboldening reformist elements within the administration and beyond. The passage of the bill has also helped to strengthen the political capacities, knowledge, and connections among a network of ‘reform entrepreneurs’ within the administration, in Congress, and in civil society. 2.2.6 Working in collaboration with civil society. See Section 2.8 later in this section. Require all companies wishing to do business with the Health Ministry to have a ‘compliance programme’ in place. Such compliance programmes are now common in the private sector (see the separate review in this website Sectors>Private Sector) and individual, progressive companies have often taken the lead in bringing the industry on board. Invite people expert in corporate compliance programmes to talk with you and brainstorm on proposals: there are many such people around. Invite companies to join with government to solve specific health corruption issues. Such initiatives have had a significant impact in some sectors and geographies, and many of the world’s larger health and services companies now explicitly support such collaborations. For example, Unilever now requires every one of its brands to have a clear purpose that contributes to a social or environmental concern, and that each product must also contribute to one or more of the targets we have set in the Unilever Sustainable Living Plan. Unilever on collective action. Such companies may be keen to work with you. These are called ‘Collective action’ initiatives; for more information on the concept see the website from the Basel Institute. 2.2.8 Changing the health industry structure to limit corruption There may be a more fundamental issue than simply pressing health companies to engage and do better, which you may or may not be able to address. The issue may be that the structure of the health industry in the country incentivises corruption. There are often hundreds, or thousands, of local manufacturers of drugs who have to sell into the grey market of hospital purchases. Besides often being poorly regulated, this also makes it harder for the larger multinational companies to avoid bribery. China has been a major example of this problem (e.g. leading to the prosecution and punishment of GlaxoSmith Kline), but also of solutions: the Government of China has moved to cut off the licenses of offending local producers (See for example The Economist (2018) China is sprucing up its pharma sector and Cockcroft 2012 pp 33-35). Independent scrutiny is key to reducing corruption. Sometimes, for exactly this reason, independent scrutiny bodies are under-resourced, or populated with low-grade staff, or denied access to key people and records, bribed or threatened, and otherwise marginalised. Finding ways to get multiple forms of independent scrutiny into effect is a core part of anti-corruption strategies. There are multiple mechanisms you can use and/or strengthen. Here are actions and examples that you can consider. 2.3.1 Strengthen independent monitoring. Monitoring by outside groups is an important part of control against corruption. Patient groups, Community groups round a hospital, specialist health forums, all can be used both as a source of knowledge about the corruption issues and as a good location to seek local solutions. In some countries these are easy to set up, in other countries the opposite is true. Some countries, especially in Latin America, have a very active tradition of citizen engagement, and they are likely to be already active on anti-corruption scrutiny. In other countries, you will need to encourage them, or find ways to support them. 2.3.2 Strengthen regulatory agencies and oversight agencies. Regulatory agencies and oversight agencies are vital parts of the control framework of a health system. However, it is easy for their standards to deteriorate, to become servants of government officials, or even for the agencies to become complicit in condoning corrupt practice. Examining how these independent agencies are functioning, the independence, competence and diversity of their members is important. The opposite problem is also common, that there may be too many such agencies. Their overlaps and organisational confusion simply enable the corruption. Example: Vietnam health system. The article calls for regulatory and service delivery functions to be split in the Vietnamese health system. There will be endemic corruption until the government realises that it cannot be both a ‘player’ and a ‘referee’ at the same time. Other countries have models similar to the Medical Council model, where a board independent of the Ministry of Health has disciplinary powers over professionals working in Ministry of Health facilities. The following options, based on the three approaches of Vietnam’s anti-corruption strategy, would help: Approach 1: Enhanced administrative oversight; Approach 2: Transparency, citizen monitoring and participation; and Approach 3: Structural policy reform to reduce incentives for corruption’ (Vian et al 2012). 2.3.3 Strengthen Internal audit. Audits and reviews of corruption risks and issues are a powerful way of raising awareness of corruption and deterring wrongdoers. But these control mechanisms are not used in health systems as much as elsewhere. Internal audit has been a low-quality department in many health systems, and often subservient to health system management or to local management. In such situations, you would be better off using an independent group to do the audits. In other countries and health systems the internal audit function is strong, and so can be used. They signal a change in the culture and show that certain areas of the health system are being targeted. Example: Health system monitoring in Colombia. In the Colombian health sector, there are currently eleven Internal Control Offices.…‘it is identified as a high-risk sector, as there are many potential entry points for poor service delivery, waste and malpractice, as well as corrupt schemes and conflicts of interest (state capture, public procurement, over-billing, doctor-patient extortion to jump the treatment queue, links between medical professionals and the pharmaceuticals industry, etc. ), which makes a strong case for an effective internal audit function.’ (OECD 2017 Colombia report, p131. Example: Internal audit leading transparency and corruption reform in Ukraine. In other sectors, internal audit has developed as the lead group in tackling corruption in that Ministry. One example is in the Defence Sector, where Ukraine has made progress led through the internal audit departments work. See, for example Barynina and Pyman (2012), and ‘The 3rdline of defence: how audits can help address defence corruption’. She leads that Department and her analysis is of 400 defence audits and reviews, all of which are publicly available. 2.3.4 Strengthen external audits and investigations. Routine external audits have a surprisingly low success rate in detecting and exposing fraud; yet this is an expensive resource, and a potentially powerful one. Carrying out reviews of the quality of external audits is one way to tackle this issue (through broader than health sector alone). Where there is a specific health external audit and investigation agency, making this a priority element of the health anti-corruption initiative can be useful. Such agencies may have been marginalised in the past, and increased focus and resources can invigorate them. 2.3.5 General health fraud audits. This is an established way of understanding the nature of corruption and fraud within a health system. In a review of case studies conducted in 33 organizations from six high income countries, concluded that the ‘percentage loss rate’ due to fraud and abuse in health care ranged between three to ten percent with an average of 5.6% of total health care costs (Rashidian et al 2012). However, the same study found that there are few health fraud audits being carried out in low income countries and even less attention is paid to fraud and abuse related to private insurance organizations. Example: Cameroon. External investigations have a vital role, and, if there is external donor aid, this is an area where the donors can actively assist. In Cameroon, the GAVI alliance initiated an investigation into massive fraud and misuse of drugs in a Cameroon project in 2009-2011 The result led to a stimulation of reform. Based on these findings, and in consultation with the Ministry of Public Health (MOPH), ‘The case study shows the benefits donor organizations can gain by adopting a transparency and accountability policy: Having a clear policy in place allowed GAVI to implement pre-defined procedures, including the FMA and follow-up investigations, which detected and responded to mismanagement and abuses. The policy was agreed upon beforehand and contained stepwise escalation procedures, which made response actions more transparent and understandable. Although the investigation revealed that government employees were involved in the fraud, which was undoubtedly an embarrassment for the Cameroonian government, they fully supported the investigation and were willing to act on its findings. In addition to providing guidance and support for the detection of misuse of funds, the TAP policy also helps to deter future violations by strengthening financial management support – not only detecting, but also preventing corruption’ (See U4 2013). 2.3.6 Strengthen or establish clinical audit. Clinical audit is an equally powerful and often under-utilised control mechanism. It is defined (Wikipedia) as “a quality improvement process that seeks to improve patient care and outcomes through systematic review of care against explicit criteria and the implementation of change“. Clinical audit only entered mainstream health care in the 1990s but is now a standard clinical control mechanism. 2.3.7 Establish a Commission of Inquiry. Sometimes it makes sense to press for a formal Commission of enquiry about the corruption, as a way to publicly address known but unexplored problems. This is a way of raising awareness of the corruption issues in a very visible public forum. It means that there will be huge attention to the health sector and may result in greater momentum for reform. Even if the follow up is subverted, such Commissions can be valuable. Example: South Africa Health Market Enquiry. An analysis of the private health care sector in South Africa ‘blew the lid off…. the Competition Commission revealed the results of a four-year investigation into competition within the private healthcare market. The inquiry found a lack of rigorous competition in sectors including pathology, hospital groups, as well as medical aids and administrators.’ For more information, read this article or the provisional report Competition Commission of South Africa 2018. Example: Uganda Commission of Enquiry. ‘The sum total of the enormous catalogue of flaws, shortcomings, errors, mistakes, and hiccups enumerated and detailed in all the above … adds up to a humongous picture of grand managerial inefficiency and incompetence. … The great losers in this sordid story were the people of Uganda; the international donor community; and, particularly so, the new experiment in Global Fund Public-Private Sector partnership’. The Commission that was very clear in its findings, but with little follow up. For more information, read this article by Cohen 2008 or a later analysis by Sekalalah and Kirya 2015. 2.3.8 Citizen Report Cards. Report Cards are a specific citizen-driven method used to generate information on the quality and efficiency of the public service as perceived by users. There are many examples of their use. To read more see Guidance STEP 2 or more details. As the Icelandic and Norwegian Prime Ministers both said recently at the Plenary session of the OECD Integrity Forum, Paris, March 27th, 2018: ‘Naming and shaming is good. Other times, the best thing you can do is to make it possible – and safe – for citizens and officials to complain or to blow the whistle. Such actions and other forms of calling out the corruption are all ways to make it clear that corruption will not be tolerated and to change the climate of opinion; even if you know you may fail in implementing sanctions. 2.4.1 Investigation and prosecution. Prosecution of corrupt health officials or company executives or politicians can jolt the system and show that there is a change of tolerance. Prosecution also responds to the demands of the public. However, prosecutions are high risk: they can be very slow, often many years, to come to court; they can be unpredictable, as powerful individuals find ways to escape prosecution or conviction. Worse, if the judiciary are corrupt, this tends to mean that corruption reform will take decades. Perhaps only Sicily, in Italy, has had success against corruption by a prosecution-led strategy. Whilst prosecution may be a tactical response to public pressure, it is unlikely to be a major part of the strategy. 2.4.2 Exert pressure via discipline, sanctions and penalties. Where prosecution may be too slow or too difficult, more active use of sanctioning, discipline or penalty procedures sends a strong signal of change, that corruption is no longer acquiesced to. Civil and administrative penalties often hold out more hope of impact than prosecution. Examine in detail what disciplining and sanctioning options you have, and how they might be strengthened, or adapted to prioritise corruption cases. Often, the priority is to move a corrupt person from their job – to allow that directorate to improve – and to sanction the individual so that he/she is not simply placed somewhere else in the bureaucracy. Example: The work of the Health Monitoring Unit (HMU) in Uganda. According to a recent re-analysis of Transparency International’s Global Corruption Barometer (GCB), the bribery rate for health services had halved for service users between 2010 and 2015. The reduction seems to be the effect of the Health Monitoring Unit (HMU). A highly visible institution with an exceptional degree of support and direction from the president, the HMU developed a strategy to improve accountability in the sector. This included high profile raids. Through highly visible investigations, the HMU seems to have been effective in making health workers in the country significantly more cautious, reducing their willingness to request bribes. Requests for bribes for health services appear to have decreased as a likely consequence of the HMU’s efforts (Peiffer et al 2018). However, though there have been bribery reductions, the naming and shaming approach has also led to reduced morale among health, because of perceptions that the HMU had unduly harassed many innocent health professionals. 2.4.3 Carry out a legal review. In the 1990s, calling for new laws or new regulations against corruption was the first port of call for reformers. Now most countries have decent laws relating to corruption. Nonetheless, there will still be multiple areas where reform of law is vital and where gaps, overlaps and ambiguities allow the corrupt to escape justice. There will also continue to be new forms of corruption, some of which may start of being legal until pressure builds to criminalise them; and new ways in which the corrupt bend the current laws to their favour, which too will need regulation. You may have many suggestions from officials on how the laws can be improved. This needs critical review, however. It is normally unwise to plan on making a large number of regulatory changes, as you are likely to get bogged down and thereby seen to be making no progress, so the changes that you will pursue need to be carefully prioritised for effectiveness. Involve outsiders in the review, not just Justice officials: also civil society, or non-government legal experts with knowledge of anti-corruption impacts. Example: Health law reform in Moldova. The results of a review in the Moldova health system, taken from USAID (214): ‘Creating integrity and ethics through (legal) reform. Working closely with the Moldovan Ministry of Health (MOH), USAID contractor MGTCP drafted laws, policy papers, and recommendations to improve healthcare services across the country. The project drafted and submitted to parliament a revised administrative code in order to strengthen the enforcement of the accreditation process of healthcare professionals. The most far-reaching legal reforms supported under MGTCP were the government order issued to create corruption reporting systems in all ministries, including MOH, and the whistle blower protection law, which was drafted and submitted to Parliament. Legal reforms supported by the program also affected the hiring process in MOH-supported facilities. MGTCP supported the MOH in issuing a ministerial order that created a competitive hiring process including objective scoring of candidates. This allowed for quick decisions and implementation of key interventions, such as the development of a code of ethics that had not previously existed in Moldova. In collaboration with a specially created MOH working group, MGTCP supported the drafting, editing, and publication of 15,000 copies of the code to medical professionals, including all physicians in the country. MGTCP helped reform procurement and bidding processes by creating a government-sponsored integrity pact, which all bidders on public tenders were required to sign.’ USAID 2014 report. 2.4.4 Examine which changes in policy might disrupt corrupt dynamics. It has not been usual for policy to be made explicitly with anti-corruption in mind. This may therefore mean that there are some policy changes that you can make that would have a significant impact. Pay attention to policies that directly or indirectly allow corruption to persist. Policy can also be captured by corrupt interests, so the challenge is also to scrutinise misuse of current policy. Along with independent review and monitoring, transparency is one of the central tools in reducing corruption. Corruption problems naturally thrive when the relevant data is not going to be made public. Transparency is an easy word to say – it is almost ‘motherhood’ – but if you find the right way to use it – or the right information that needs to be made transparent – and you can do it in a way that people recognise, then the impact can be great. One such example is to publish surgery waiting lists, when before they were held by the surgeon and used to extort bribes in order to rise up the waiting list. The beneficial effect for patients is out of all proportion to the generic statement of ‘making data more transparent’. 2.5.1 Identify public service data that needs to be transparent. This is context and sector specific, so you need to brainstorm with colleagues on what data would most show up corruption or improper influence. It can be very simple, such as publishing hospital waiting lists for surgery or publishing how much of the primary school education budget is actually received by each school. The more resistance there is to publishing data, the more likely it is that there is some corruption reason behind it. Examples include Wait lists for surgery (with suitable measures being taken to prevent patient identity), Boards showing the Presence/Absence of clinical staff in the hospital, the Average unit costs of drugs in hospitals, regions or in the country. Also useful are comparisons with international public sources for cost of common drugs (from MSH, MSF, WHO, GFATM etc) so that someone can see if the country is paying above the world market. In all such data cases an important related question is which forum you use to present the data. Is it electronic, or via meetings, or in journals, or to patients’ organisations, or highly visibly, e.g. on boards at the front of the hospital, or in newspapers? Example: WHO Good Governance in Medicines initiative (GGM). 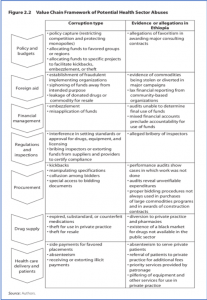 The WHO has created process indicators for transparent and accountable drug promotion practices as part of the Good Governance in Medicines programme. The GGM approach to increasing transparency in public pharmaceutical systems includes three steps: risk assessment, development of a national framework for responding to identified needs and implementation of approaches such as procedures for disclosure and management of conflict of interest, web-based medicines registration and licensing systems, and other interventions. To date, 26 countries are participating in the GGM, including Cambodia, Malaysia, Mongolia and the Philippines. Example: Transparency measures in seven countries in the Medicines Transparency Alliance. The WHO Medicines Transparency Alliance (MeTA) fostered policy dialogue to bring together government, civil society and private company stakeholders concerned with access issues in health and to promote transparency. An analysis of the effect of this in seven countries (Ghana, Jordan, Kyrgyzstan, Peru, Philippines, Uganda, Zambia) found strong evidence that transparency was enhanced and some evidence to suggest that MeTA efforts contributed to new policies and civil society capacity strengthening, although the impact on government accountability is not clear From Vian et al (2017). 2.5.2 Build transparency into systems and metrics. Good HMIS data is essential for tackling corruption. You need data on relative costs of procedures from one site to another, on stock levels, on costs per patient per diagnosis. Sometimes, getting this data is a ‘normal’ function of upgrading the HMIS to give you that functionality. Often though this is not the case: the official systems are often old, cumbersome and unsuited to any such intelligent query. In which case you have to decide if the problem is worth a separate management information system or application. In one OECD country the Health leadership had exactly this latter problem and, despite huge budget constraints, were able to produce an alternative HMIS that was dramatically more useful than the old, official system. As a result, they were able to scrutinise treatment costs between hospitals that led to a major improvement in performance and reduction in corruption. Example: Less corruption in the medicines system in Thailand. Thailand participated in a WHO Good Governance for Medicines programme, with a number of significant achievements, such as lower costs for medicines, and national pharmaceutical laws reviewed. Thailand’s Dr Tharathep offers this advice for other countries: “First of all, they should do a medicines situation analysis in their countries, then develop a good governance framework appropriate to their context and environment. The gap between the existing system and the framework should be identified and the strategy should aim to fill the gap…The transparency of the system is one of the crucial activities. 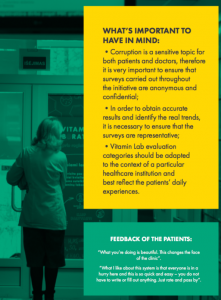 For us, the pharmacy information centre has been the best tool for transparency. We have the pharmaceutical products prices from each company who sold their products to the Ministry of Public Health hospitals publicly accessible.” Read more. 2.5.3 Require all engagements by senior public officials be routinely disclosed. If public money is being used, then there should be a presumption that the interactions should be public. Examples include senior public officials having the whole of their daily agenda online (as in the European Commission), or new contracting and procurement that require all contracts, progress reports, tender submissions and so forth to be available online (see Open Contracting Partnership here, for example). The simple way to do this is for the electronic calendars of officials to be available online. 2.5.4 Require that all health budgets, and spending, are disclosed. This is not yet the case in many countries. You need to see the Open Budget Survey to identify countries, here. This authoritative survey shows that even in an uncontroversial sector like health, such data is often not available. Citizens often want to know how much their government spends on a particular service and how that spending is changing over time. Answering this question is not as simple as it sounds. Besides the Ministry of Health, you probably need at least the “functional classification” that organises spending by functions or purposes, as well as spending by state corporations that support health services (such as public insurers or suppliers). If the health system is decentralized, funds to lower levels of government might not be captured under the central Ministry of Health budget or the functional classification of national spending and you would need quantitative and narrative information about such transfers. The table below from the survey provides a summary of the level of availability of these types of information. While two-thirds of countries surveyed have a basic functional classification, less than half provide any of the other types of information described above. 2.5.5 Consider requiring all internal and external audit reports to be published. Are all external audit reports public? They should be, though many are not. One public analysis suggests that about 85% of external audit reports are made available publicly (Institute of Internal Auditors, 2012). Internal audit reports are more commonly not public: only 10-14% of public sector reports were made public according to the quoted study. There is sometimes justification for non-publication – it can lead to big problems being kept quiet rather than written in the report – but the opposite problem is usually bigger: if the report is not public, it can be buried, and marginalised. It is less difficult and restricting to make internal audit reports public than officials might imagine. In Ukraine, for example, internal audit reports are publicly available (Barynina and Pyman 2012). 2.5.6 Watch out for when transparency does not work as intended. Transparency may be good, but it is not a panacea. Often data and reports are made transparent, but the underlying corrupt behaviour still does not change, especially if the public and NGOs are disinterested in examining and acting on the data. What more do you need to do? The answer is often to encourage civil society to make more use of the newly transparent information. There may also be different understanding of transparency among staff, because transparency means different things to people depending on what level you are in the organisation. Example: Transparency in US health care means different things to different people. ‘Much research on transparency in global settings has focused on institutional design, such as online performance reports and external budget transparency. Yet, these avenues of research do not help to illuminate how change develops in an organization and the micro organizational social processes which influence policy implementation. Eliciting narratives of transparency in health care organizations can be a tool to gain insight into how to develop and nurture organizational cultures which are favourable to transparency, adapted to particular social, economic, and country contexts. The analysis of this small set of stories suggests potential areas where people may understand transparency differently depending on their organizational position and prior experience. … Narrative analysis focused on stories of transparent and non-transparent behaviour can help researchers gain insight into human conduct and relationships which affect organizational accountability. These insights can, in turn, help in the design of interventions which cultivate a transparency culture and promote good governance. Taken from Vian, 2012. Reducing corruption is as much about establishing a strong integrity framework among public officials and the population as it is about directly addressing corruption. The norms of most societies and of all religions include acting with integrity. However much this may seem to be overly optimistic, it strikes a strong chord of emotion and pride in people. Building on this desire – such as through discussions across the organisation, in leadership fora, and in collaboration with other interested parties such as patients organisations – is fundamental to developing a high integrity organisation. 2.6.1 Improving the integrity of public officials. Creating and maintaining a culture of high integrity behaviour among health professionals and health officials should not be so hard; These are among the most caring groups of people in society. However, powerful social ‘systems’ can be more powerful in driving human behaviour. As quality engineering guru W. Edwards Deming once said: ‘A bad system will beat a good person every time.’ The OECD is increasingly active in working with countries to structure suitable ‘integrity frameworks’ for the nation’s public officials. Recently this has included work in Mexico, Colombia and Thailand, for example. And, speaking out loudly and clearly against corruption. There is a useful report Integrity in healthcare organisations from the Netherlands Health System (CEG 2016), which analyses integrity approaches to health care. They analyse five situations where the integrity is most tested in health care organisations: conflicting interests and expectations, dealing with errors, remuneration of administrators, perverse incentives within the system and peer pressure. Example: Professional integrity for health staff in Australia. Here is an example of the professional health staff code from Australia. Example: A structured approach to Integrity Codes in Colombia. Colombia has put considerable effort into developing integrity across its public administration. 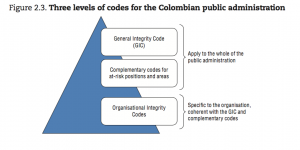 In relation to Integrity codes and codes of conduct, Colombia has a three-level model, from national, to at-risk positions, to specific Ministries and organisations. If your country has a similar structure, then you will want the health system codes to align with the national level ones. The OECD report on this effort is worth reading (OECD 2017, p67), as are the reports for Mexico and Chile. 2.6.2 Consider the benefits of awareness raising and capacity development. General anti-corruption education for officials and building the capability of oversight and regulatory bodies can be a useful measure, especially if they reach a critical mass of people or officials, and in environments where it is hard or dangerous to have more direct impacts. This is one way to show that at least something is happening, however modest. Whistleblowing is now an accepted mechanism, and most large bureaucracies have mechanisms for complaints and or whistle-blowers. At the same time, these mechanisms are usually weak, may exist on paper only and the whistleblowers usually end up suffering. Yet these mechanisms are vital in identifying and calling out corruption: the challenge is to find a way in your context to make them effective, and to publicise this. This has been done in countries and companies, so it is quite possible. 2.7.1 Encourage complaints mechanisms. These mechanisms are vital in identifying and calling out corruption and the challenge is to find a way to make them effective. Civil society has often shown that it can be a more honest and independent way of checking performance and/or being a trusted place that complainants speak with. Today, many complaint systems are actually run by NGOs for this reason. Besides feeling confident to make the complaint to someone, the other half of the complaint system is assurance that there will be prompt and accountable complaint investigation. There needs to be a range of sanctions (fines, loss of contract renewal) which can be implemented without going to the judiciary. This second part of the system has worked badly in many public health systems. In some it is just because of budget pressure. But in others it is more corrupt, being driven by the interests of professional groups, such as doctors or health officials, to protect themselves by ensuring that complaints do not get concluded. So, making an effective complaint system can be more about making changes to the power balances within the health system than about the technicalities. Sometimes, a solution has been for a top official to take the complaints directly and personally. For example, in another sector, the top official made himself personally available all day every Monday to hear complaints from citizens. 2.7.2 Be open and public about the depth of the corruption. Do not underestimate the effect that you and senior colleagues can have just by speaking openly and publicly about the corruption problems. When the head of the World Bank spoke about corruption in 1996, after years of silence, the effect was huge. Countries such as Estonia and Georgia have had considerable success. particularly in the earlier years of their reforms, they made it publicly clear that curbing corruption was the top mission of the government. It was clear that the government would stand or fall by their success in tackling corruption, and this gave them greater credibility with the public; though more recently, some of the progress is being undone in Georgia. At local level, you have much opportunity to enlist citizens for change, or to be pushed forward by citizens who are determined to achieve change. The involvement of civil society can be unpredictable – they are of course not under your control – but for the same reason it gives your initiative more of an external reality. Some countries have a social tradition of very high levels of civic engagement. 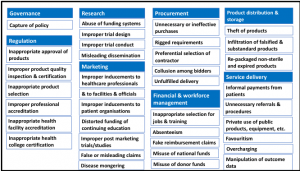 This can be harnessed to involve patients in reform against corruption – whether via consultation, policy participation, or active co-creation of some of the initiatives. The table opposite, for example, presents the results of surveys reviewing the levels of civic engagement in nine Latin American and Caribbean countries. 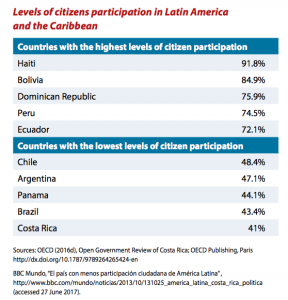 Some of the countries have very high levels of civic engagement, while others in the same region do not (OECD 2017, Chile report). At local level, therefore, you may have good opportunities to enlist citizens for change, or to be pushed forward by citizens who are determined to achieve change. This may involve a ‘call to action’ for citizen involvement, or it may happen naturally. A successful approach involving citizens can have different formats, procedures, purposes, success factors and costs; it can yield better-quality policies, stronger legitimacy and prevent policy capture. However, ‘findings from the Bertelsmann Foundation indicate that national and local governments may struggle to actively involve citizens. A full 50% of the 20 health ministries surveyed registered similar.’ (From OECD 2017 Chile report, p23). Collaboration with civil society organisations is a natural mechanism for reform on corruption. Many of them have a sizeable expertise on corruption, they have a much greater freedom to intervene when there is misbehaviour than official hierarchies do, and they can help in reaching out to the wider community to build trust. The desired impact will usually be something tangible, such as lower drug prices, more free access to doctors, fair treatment of patients on waiting lists, rather than ‘reduced corruption’. Example: Improved maternal and child health across ten countries. In an analysis of success factors for 10 countries – Bangladesh, Cambodia, China, Egypt, Ethiopia, Lao PDR, Nepal, Peru, Rwanda and Vietnam – the World Health organisation (WHO) found that one of the success factors was an active approach against corruption. ‘Rapid reductions of maternal and child mortality and dramatic improvements in reproductive health and rights are possible despite political and economic challenges…While the mix of strategies and investments used to address high maternal and child mortality rates differed to meet local context and priorities, fast-track countries some shared some successful approaches … among which good governance – including political commitment and control of corruption– underpinned progress overall. WHO (2014). This showed a recognition of corruption issues in the programme, but not letting it dominate as a key objective. There are too many choices: Focus on large-scale changes or small changes? Prioritise fighting corruption or building integrity? Prioritise a preventive strategy or a prosecution-led one? Prioritise specific technical reforms or allow scope for diversity and improvisation? And so forth. Example: Vietnam and a low-profile strategy. Vietnam’s health anti-corruption strategy in 2012 was to make indirect improvements with very little public profile, leaving the public benefit and the opposition to become evident only later. Opposite is an example of such a strategy, from Vietnam The elements of the strategy were as follows: Re-design of provider payment systems to change incentives; Increased transparency in medicine pricing; Expanded avenues for patient feedback; Streamlined administrative procedures; Improved information system to detect and deter fraud; Expanded civil society watchdog monitoring and reporting; Managing conflicts of interest among public sector providers; and Increased detection and punishment of officials who accept bribes & kickbacks. (Vian et al 2012). Example: High-income country draft health strategy. Here is a recent example of how one developed country drafted its health anti-corruption strategy. They decided it would be in two parts: 1) Structural reform and 2) Providing real information direct to citizens. PART 1: IMPLEMENTING NECESSARY STRUCTURAL REFORM. The Ministry drafted seven structural reform priorities: Better information availability and transparency; More robust purchasing and stock management; Stronger controls over high pricing of medicines and materials; Stronger controls over corruption in medical practices; Strengthening control over semi-independent health agencies; Better auditing – admin and clinical – and better controls; Strengthening sanctions and discipline. The Ministry will also work more closely with the representatives of the health industry – because their active cooperation is essential – and so that they too sanction bad industry behaviour. PART 2: GIVING CITIZENS REAL INFORMATION. The objective was to give citizens a more powerful voice, so they feel their complaints, especially about corruption, are being heard and acted upon, and to ensure that their feedback actually reached health leadership and health inspectors. The Ministry drafted three priority work areas: Public information on waiting lists and key facilities; Public information on hospital daily effectiveness; and Strengthening patients’ rights offices. Example: a large-scale health reform strategy in Afghanistan. The government supported a major initial analysis of the corruption weaknesses in the Afghan health system, carried out by the Afghanistan Independent Anti-Corruption Committee (MEC) in 2016, despite knowing it would be highly critical. The principal parts of the reform strategy were: Expanding the role of the local Health communities (Shuras); Expanding Independent Oversight; Overhauled Auditing; Strengthening the Independent Council; Much closer liaison with the Attorney General to advance prosecutions; Independent oversight and monitoring of all senior health appointments; and Improving the quality of imported Pharmaceuticals via an overhauled regulatory body amalgamating several previous bodies. A major feature of the reform strategy was that the Anti-Corruption Committee instituted an independent ‘Active quarterly follow up’ of the recommendations and the Ministry action plan. This is done by a team of two people, who spend one month every quarter vising hospital and Ministry sites to see what progress is being made. They write a detailed progress report which is discussed with the Minister and his health leadership team each quarter, and which is published and publicised in the media. The sixth of these quarterly follow up reports has recently been published by the Afghanistan independent Anti-Corruption Committee (2018). Example: Lithuania and thinking small. Lithuania is a country that has been making significant progress against corruption. Hospital clinics and a local NGO (Transparency International Lithuania) worked together to reduce corrupt ’informal payments’. They found that corruption perception levels can be directly related to the willingness to recommend the institution to others. The NGO produced a guidebook to help others who are striving for small, tangible victories in your work and looking for new, better ways to serve their clients. As the authors say: “We hope that this guidebook will give you a better understanding of how to seek for positive changes in your institution”. Corruption reforms usually involve several groups of stakeholders, whether the reform is small, like eliminating informal payments for child care, or large, like passing a bill to improve health outcomes in a country. Example: Passing a law to tax alcohol and cigarettes in the Philippines. The objective was to pass the ‘Sin tax’ law. Whilst there were many corruption issues also associated with the previous situation, the coalition that was put together was established on the basis of common incentives to pass the law, not to address corruption. Read more on this example in Section 2.2.5 above. An anti-corruption initiative might be small, such as a single project, but many of them involve multiple projects, in different parts of the country, in different agencies, and will extend beyond the Health Ministry boundaries into other ministries and agencies. This requires a more formal ‘programme management’ approach so that they are each managed properly, there is a full-time person or team doing the coordination, proper tracking system in place, and there is regular reporting so that those in charge, or the Steering Committee, are kept up to date. Example: Planning implementation of national clinical protocols in Moldova. USAID, working with Moldovan physicians, ran a major reform project on implementing clinical protocols. They developed 90 Clinical protocols, distributed 2,000 copies of each protocol distributed to health care facilities nation-wide, trained medical specialists in protocol drafting to facilitate continued improvements, and created 14 pilot quality councils, which were expanded nationwide in 2009 (USAID 2014). Unless your ministry is a beacon of integrity in an otherwise corrupt government, or your project is very small, you should expect your reforms to be an integral part of the broader reforms in your health system. Sometimes the action will be 90% the same as a reform that the ministry is already planning or undertaking, such as having a good HMIS, improving controls and improving HR practices. The ‘added-value’ of an anti-corruption angle is that you would not think about the corruption aspect if you were just thinking about effectiveness and good practice. Nevertheless, be explicit that you are tackling corruption. You may be tempted, and you may also hear expert opinion, to suggest that the ‘normal’ institutional reforms will in due course take care of the corruption problems; so that no separate emphasis on corruption will be required. We believe that you should not do this. Such advice often arises because people, especially experts and donors, feel uncomfortable talking explicitly about corruption. Such advice ‘permits’ them not to delve into this subject, which is obviously wrong. People who are the recipients of the health services – patients – will have no hesitation in recognising corruption, and they will rightly be suspicious of reforms that do not explicitly tackle it. There are several other alignments also likely to be necessary: with the government’s anti-corruption strategy as a whole, with other government good-governance policies, and regional alignment. Many health corruption issues can be addressed within the health sector of a single country, as we have been discussing here. However, other issues can only be properly solved through an international approach. Examples include medicine regulation, pharmaceutical authentication, medical company behaviour and other issues such as responses to pandemics. Attention to these international health corruption issues also means that global expertise is increasing. As health corruption expert Taryn Vian, Clinical Professor of Global Health at Boston University School of Public Health says: ‘Fortunately, an emerging body of knowledge is helping to translate the findings of anticorruption research into operational anticorruption programs. While we still have much to learn, a number of general lessons from this field are already proving useful for designing and implementing anticorruption reforms’ (Vian, 2010). Experts suggest that the concept of global health corruption should be expressly defined, discussed, and adopted through an international legally binding framework employing partnership with the World Health Organization and UNODC. They also suggested that global efforts to address global health corruption could be operationalized. Policy makers are recognising that the size of the health sector ($6.5 trillion in 2012; expected to reach $18 trillion by 2040) means that the international health community needs to pay more attention to tackling the damaging effect of corruption. The UN special rapporteur on human rights called in 2017 on States to provide bold leadership to confront corruption and its severe impact on the right to health, including more protection for “whistleblowers” and empowering the public to report corruption. “In many countries, health is among the most corrupt sectors.” The Special Rapporteur stressed that there is a normalization of corruption in healthcare, involving not just corruption that clearly breaks the law, but practices which undermine the principles of medical ethics, social justice, transparency and effective healthcare provision (Office of the High Commissioner for Human Rights, October 2017). What is needed, but not yet in place, is a unifying governance framework that can enable governments to take more responsibility for addressing the irregularities. The article by Mackey et al (2017) Combating healthcare corruption and fraud with improved global health governance is worth further reading. Boston University School of Public Health Professor Taryn Vian and colleagues have been working on corruption in the health sector for over two decades. See for example Vian et al (2010). Anticorruption in the Health Sector: Strategies for Transparency and Accountability, and other publications authored by Vian et al listed in the Bibliography below. Transparency International Healthcare programme TI’s Pharmaceuticals and Healthcare anti-corruption programme is a global initiative of TI based in London, dedicated to tackling corruption in pharmaceuticals and health care worldwide. Several TI Chapters around the world are also specifically involved in tackling healthcare corruption. The TI Secretariat in Berlin was also instrumental in highlighting the topic of health corruption back in 2006 with a whole annual report on the topic (TI 2006). In addition, the Anti-Corruption Resource Centre U4, Norway, have published several reports on health corruption in the past, and also have a training module on health corruption, though this has restricted access. Within health, the obvious first place to look for global initiatives and global expertise is the World Health Organisation (WHO). They have been taking the lead on many good governance initiatives, such as Good governance in Medicine (WHO 2010) and the Medicines Transparency Alliance (MeTA). They also have done specific corruption analyses, for example World Health Organisation (2010) An innovative approach to prevent corruption in the pharmaceutical sector. However, there seems to have been little focus on tackling health corruption at an international level to date since the initiative on Good Governance in Medicines (GGM) and preventing corruption in the pharmaceutical sector. WHO has itself come under fire for corruption and waste within its own organisation. See for example here and here. More recently, one group within WHO has started to suggest global action to improve health system governance. The Health Systems Governance Collaborative was born from this urgent need for new collective action. The Collaborative is set up to work as a global network, made up of participants from various backgrounds: technical experts, agencies, policy makers, and citizens’ representatives’ (Bigdeli et al, 2017). The Health Systems Governance Collaborative express the need from a helpful historical perspective: Back in 2007, the WHO proposed a six building blocks’ framework to categorize and analyse health systems . In this framework, health system governance was defined as: “Ensuring strategic frameworks exist and are combined with effective oversight, coalition-building, attention to system design and accountability”. Then on their website, this group says ‘First, we must admit that for the past decade, we have paid much attention to the first part of this definition: “ensuring strategic policy frameworks exist”….. Secondly, without denying the critical importance of policy-making capacity and strategic planning processes in the health sector, we must also acknowledge the need to examine more closely the latter part of the governance definition put forward by WHO in 2007: “effective oversight, coalition-building, system design and accountability”. Much less has happened in this respect in the recent past, although some authors in the health system literature have ventured this less travelled route: a recent systematic review identifies 16 frameworks for health systems governance published between 1994 and 2014, but only five of them have been applied in practice and only three considered governance at multiple levels of the health system. When travelled, the route therefore remains vastly theoretical; it is difficult to grasp what are the concrete actions that could benefit health system governance and improve health system performance. Development agencies spend billions of dollars on health improvements in developing countries, although only a few per cent of it is targeted at corruption issues. They do produce some analyses of corruption in health, such as from DFID (DFID How-to Note; addressing corruption in the Health sector). USAID has done a detailed analysis of its anti-corruption programming, which has an Annex with their experience with health projects. For countries where part of the health budget is provided by partners from other nations, whether this be in the form of aid, or regional projects like in the EU, Development agencies have considerable power that you may be able to leverage. You could press them, for example, to require strong integrity clauses, transparency of contracts, and intrusive audit rights. You can encourage the international bodies to take corruption more seriously. International health specialists, for example, can be uncomfortable when discussing corruption, and development agencies may feel they have more to lose by identifying the extent of the corruption than by passively working around it. Agencies are sensitive to charges that they are not serious about corruption. For a critical review, see Kenney (2017) Results not receipts: how much aid is really lost to corruption? Global Fund The Global Fund is one organisation that has been at the forefront of some of these efforts as it has sought to eliminate corruption related to its own disbursements (Usher 2016 Global fund plays hardball on corruption). European Healthcare Fraud and Corruption network (EHFCN) EHFCN is a not-for-profit organisation financed through subscription fees, founded in 2005 as a result of the first pan-European conference held in London in October 2004. Its members are healthcare and counter fraud organisations in Europe. EHFCN has published a book on Healthcare fraud, corruption and waste in Europe: national and academic perspectives (EHFCN 2017). U4 Anti-Corruption Resource Centre, Norway. U4 have expertise in health anti-corruption. They also have an online module on tackling corruption in Health. A new global anti-corruption standard for health? See the discussion and call for this in Section 4.1 above. Vian, Taryn, Savedoff, William and Mathison, Harald (2010) Anticorruption in the Health Sector: Strategies for Transparency and Accountability. Kumerian press, published April 2010. 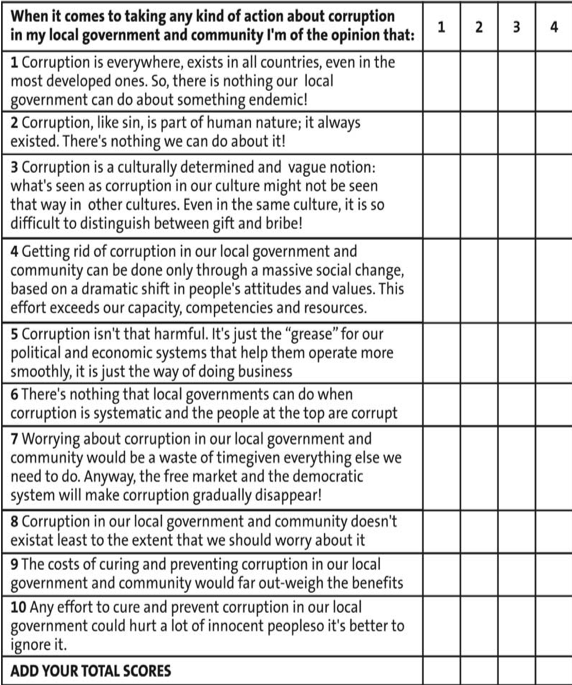 USAID’s 2014 analysis of anti-corruption programming, Annex 4 is about the experience with health projects. Transparency International has a programme on tackling corruption in health care. This programme is gradually building up, so their health website is worth following. Muravjovas, Sergejus (2016) How to achieve a small victory. The case of the Ladzynai Outpatients clinic (Lithuania). http://www.transparency.lt/wp-content/uploads/2016/11/Social-design-experiments-in-healthcare_2016.pdf. See also this video (with subtitles): https://www.youtube.com/watch?v=G31HLtVdqyo.